The Leap freestyle class is a fun environment that you can learn new tricks and flips. We will help the participants to learn and become more confident with basic vaults, through to more difficult flips. The class is run by one of our team members, Andre Theis, who has a background in coaching trampolining and parkour in a gymnastics club. A number of other staff are also involved, all keen to help you achieve your favourite trick. 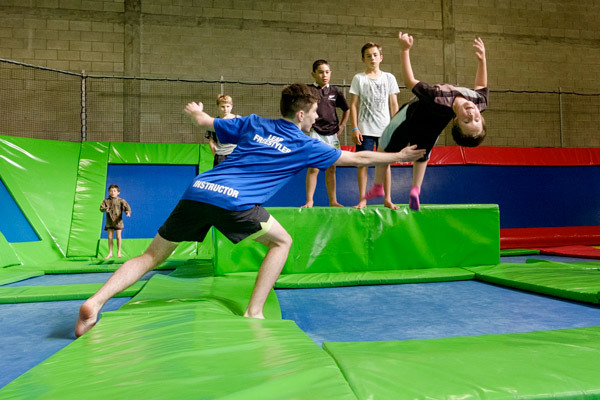 The class is casual and mostly focusing on individual goals, as there are a variety of skill levels ranging from participants who are new to trampolines through to ones that have been learning tricks for years. We usually start the season with a quick warm up and stretch and then get into the flips, and we always end the class with a big game of dodgeball. This class is all about learning new things and having a great time, there is no certain standard that you have to be at, just come on in and we will get you into a class. The freestyle class is perfect for anyone wanting to learn skills in a fun and controlled environment. $10 a session or $120 term including a t-shirt. We have two options, pay week by week or book a whole term for $120 and you can get a free t-shirt! Book now to avoid disappointment as classes have limited spaces. It takes time to master specific skills on a trampoline but because it’s so much fun, kids will often persist until they get their moves right. When kids leap on a trampoline their brain is forced to function bilaterally as they leap up and down in the air. Both sides of their brain and both sides of their body must work together to maintain coordination and balance when on a trampoline. This in turn helps increase their motor skills. Jumping on a trampoline strengthens and lengthens muscles and improves flexibility.